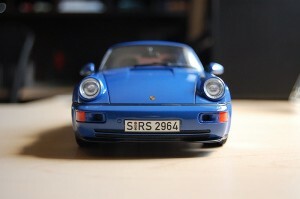 As you know, the Porsche brand resonates highly with me, and the fact that I’m now going to able to add a Porsche 964 platform car to my collection couldn’t make me happier. 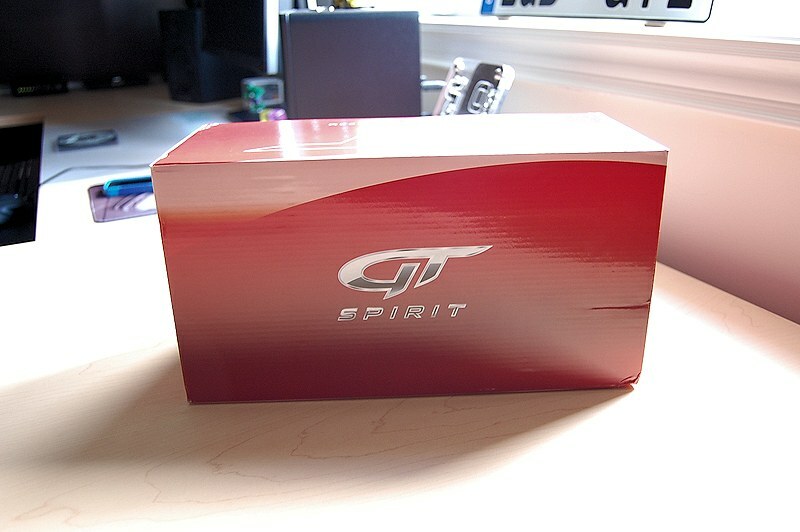 So there was much anticipation and expectations on the latest release from the team at GT Spirit. 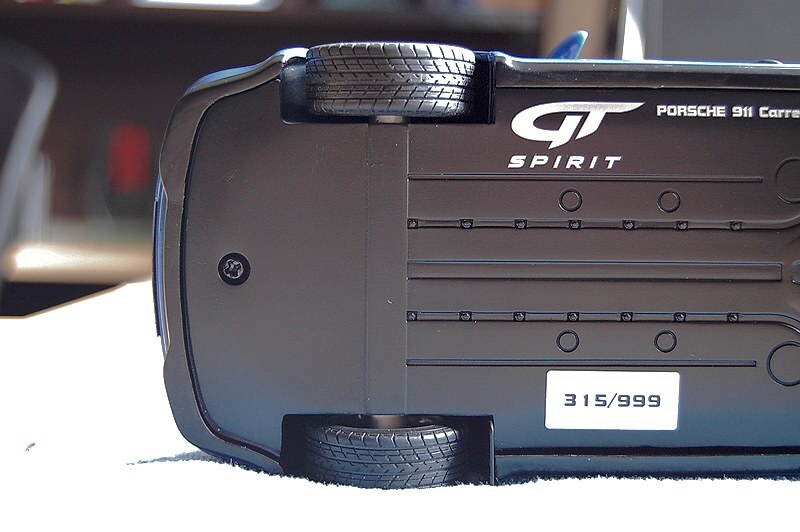 GT Spirit came forward about a year ago at the Nuremberg Toy Fair, announcing their entry in the into the 1:18 and 1:12 scale resin market. 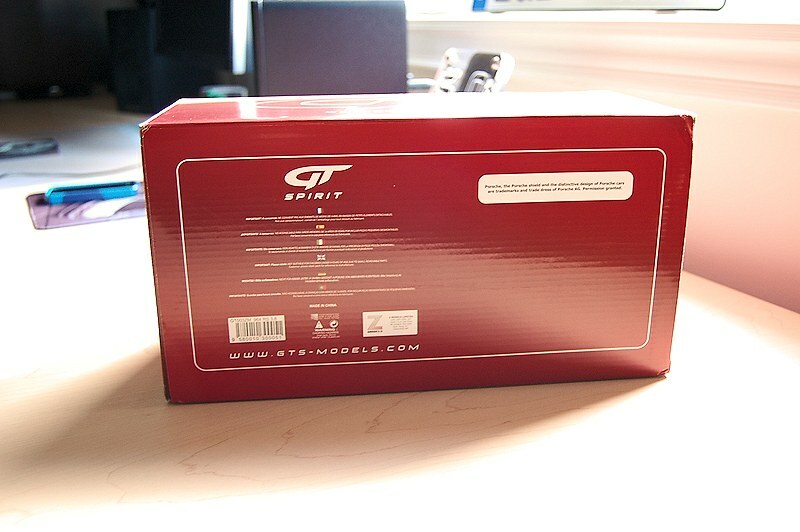 GT Spirit promised a new perspective, one that brought forward unique and valued models from various brands such as Porsche, BMW, Mercedes and more, basically bridging the gaps other manufactures ignored or did not care to produce that us collectors were crying for. 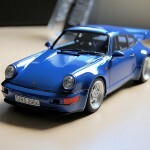 I’m happy to introduce my first GT Spirit model the 1:18 Porsche 911 964 RS 3.8. 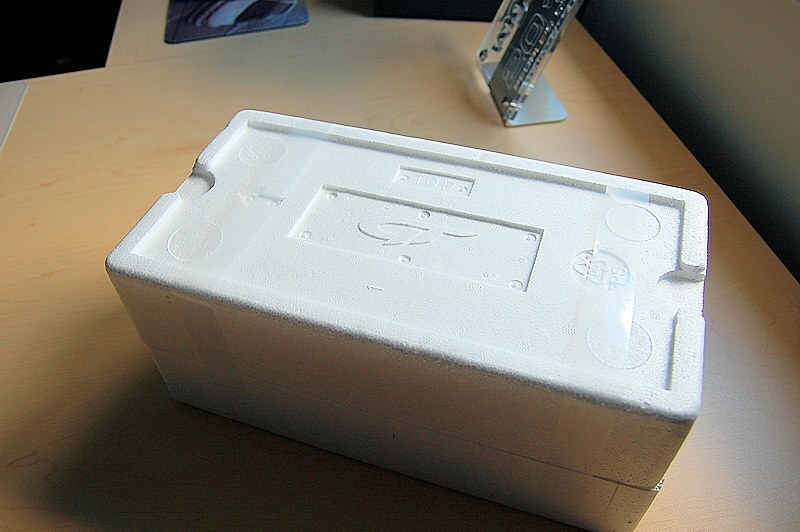 In the box you will find a styrofoam shell. 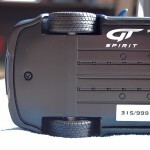 Top side features the GT logo, while the back side has the wood base that is assigned as a bonus piece to GT Spirit “Club” labelled models. 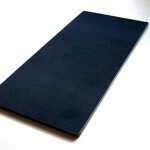 The wood base is lacquered in a black finish with the back side covered in felt. Nice touch but it did leave me wondering why. Do I personally have use for the base? No. In my opinion I would recommend this piece be deleted and any added saving be put back into the model – i.e. interior. What are your thoughts? The model itself is brilliant! It met or exceeded most expectations. 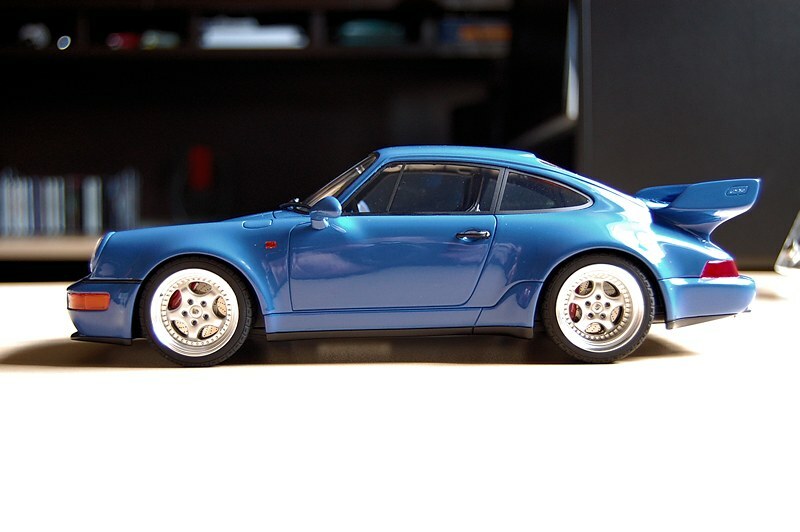 I’m no authority on Porsche or the 964 platform but the CAD techniques utilized by the team at GT Spirit seem to capture the essence and exterior lines of the 964 RS without fault. It may not be perfect but it’s very close! The paint is some of the best I’ve seen to date, definitely the best on any resin model. 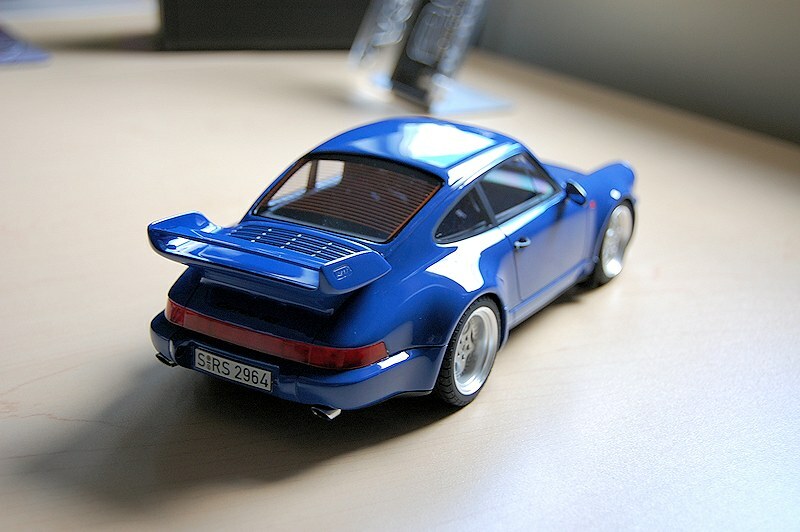 The Porsche Maritime Blue is so good, it still looks wet to the eye. 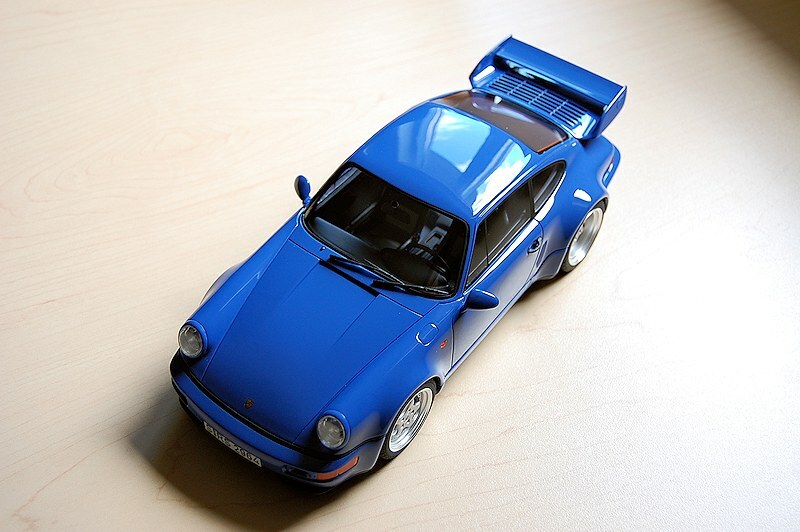 Front fascia doesn’t have perforated lower grilles, but what resin models do. 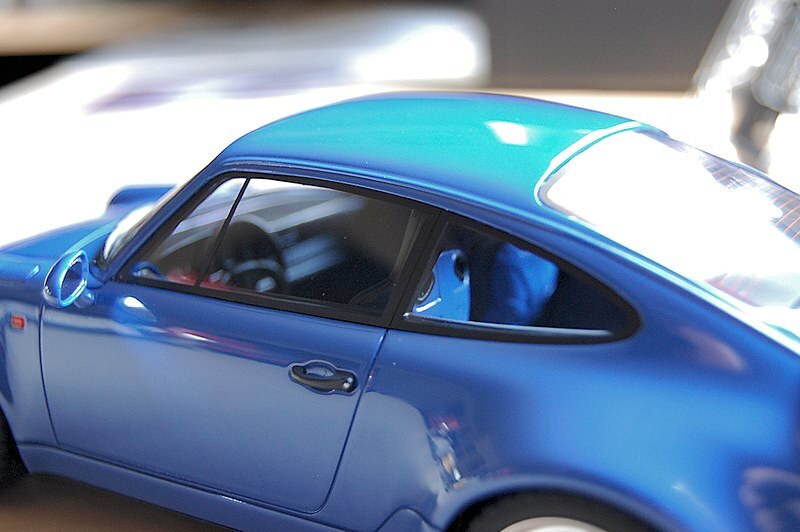 Headlights are nicely executed too, as well as the side indicators and intakes. 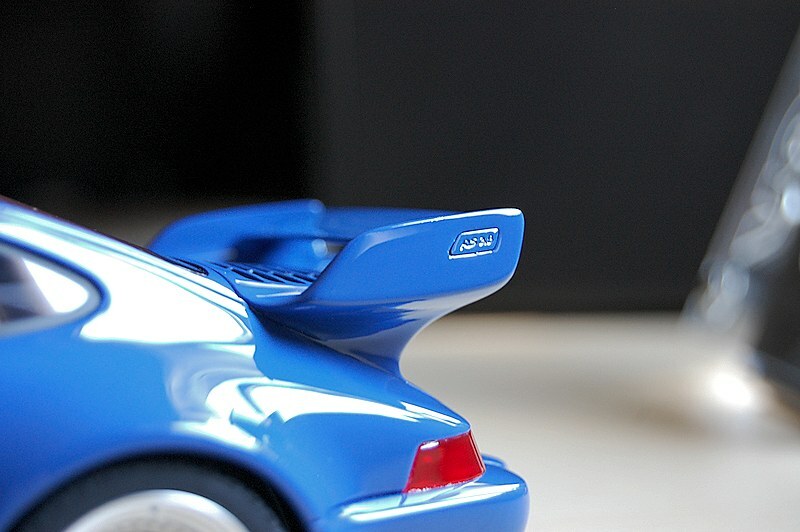 The rear features a massive wing. 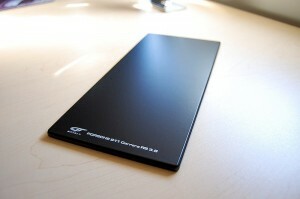 Nice to see the RS 3.8 logo wasn’t missed on the side. Carrera RS badge logo looks great too. 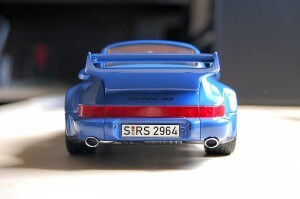 My only complaint would be the unfinished look of the rear taillights, execution could have been a little better. Other items I like to mention are the European plates, beautifully executed and fit this car so well. Also the door handles and side markers, nice to see attention to the finer details and not just some paint or after thought here. Well done GT Spirit! The wheels and tires. 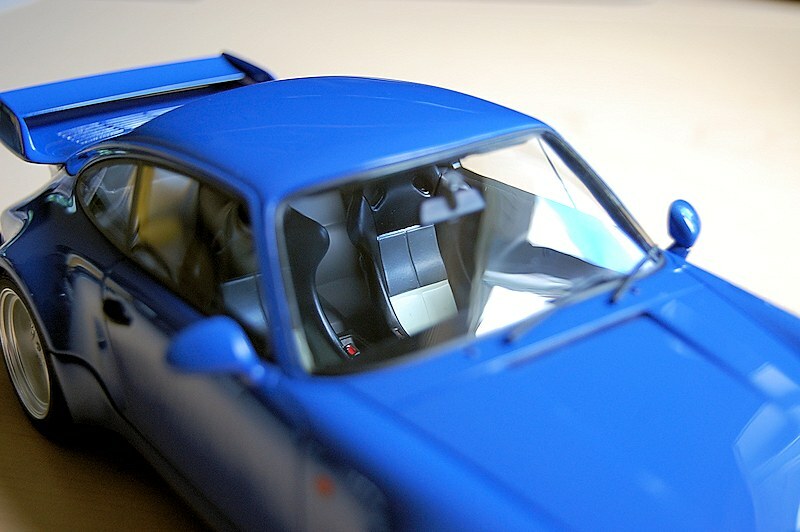 Now you all know this is my favourite part of any model and GT Spirit (thank you) do excel here! 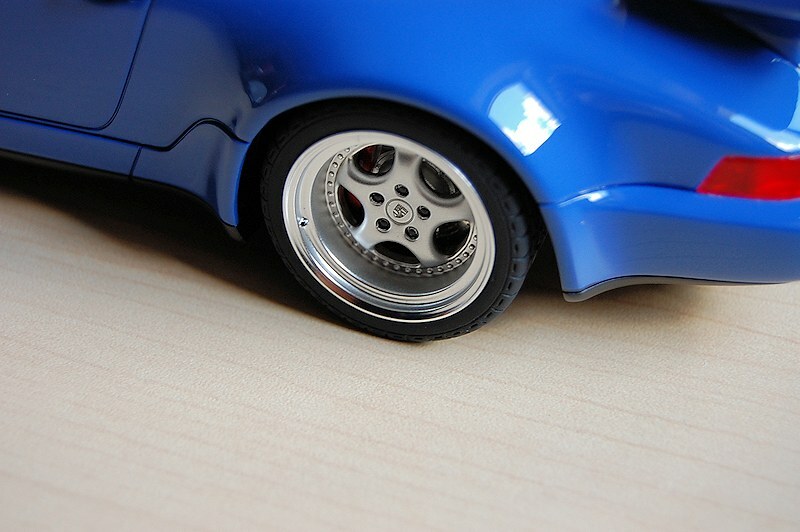 I’m going on record and saying these are the best replica rims for a model sub $150 that I’ve seen to date! The detail, the paint work, the entire package is top notch! 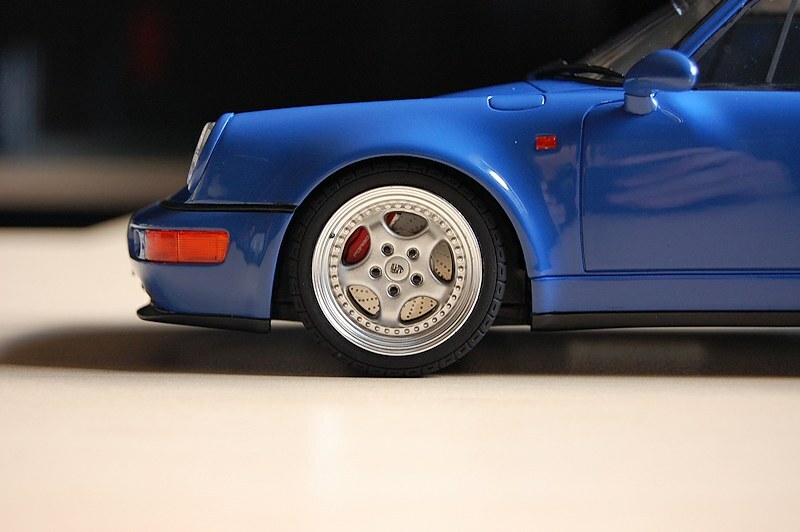 Top it off with a very realistic set of rotors and calipers, and you have a winning combination. Also notice the deep dish offset on the rear. 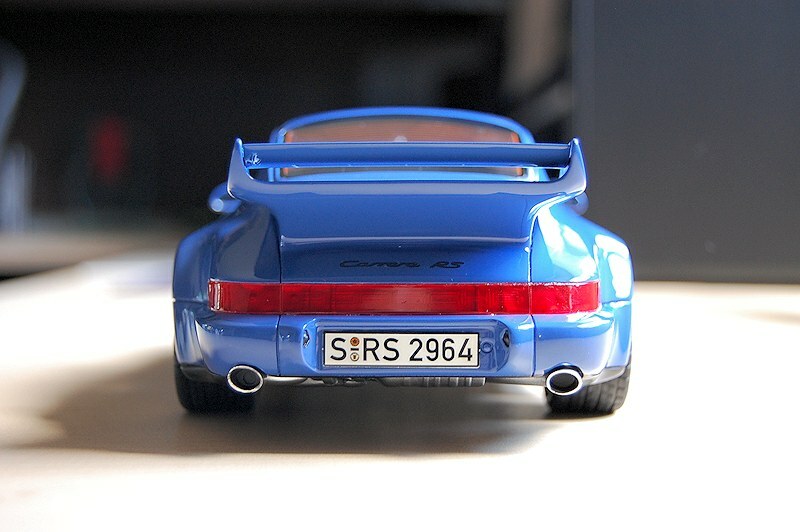 Definitely helps define the fat rear end of RS. 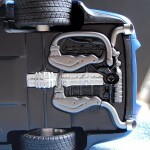 I did however have some concerns with the tires based on photos I’ve seen prior to delivery. Actually in person they aren’t as chunky as you may think. Now would I recommend a different profile for future models? Definitely. 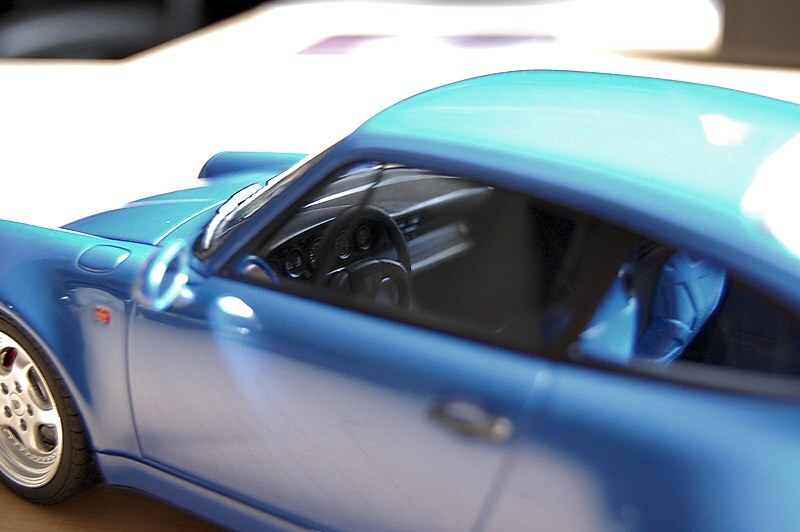 Interior has all the components of the Porsche RS 3.8 but it left me wanting more based on the exterior execution. 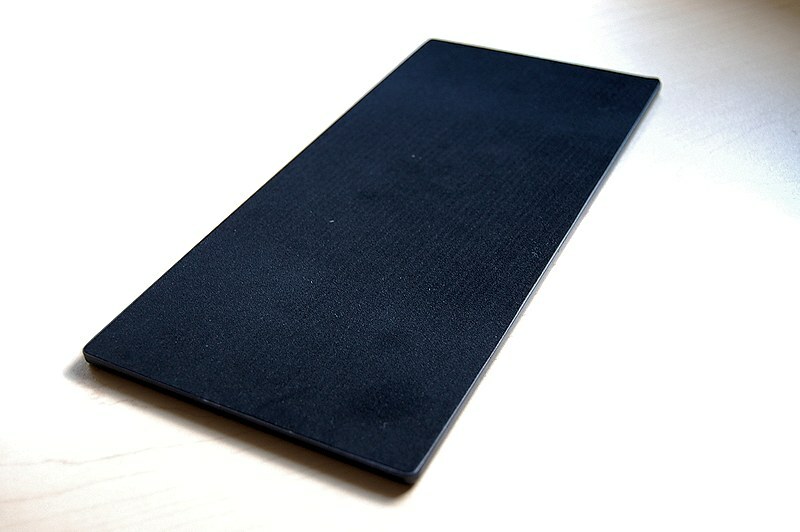 Though all the elements are here, the overall look is too generic, it just isn’t polished enough. There is no carpeting or finer detail that I can see other than the painted back side of the RS seats. I understand we’re dealing with a sealed model but my recommendation would be to address that for future releases, taking an excellent model to brilliant. There isn’t much going on motor wise as we’re dealing with a sealed model. 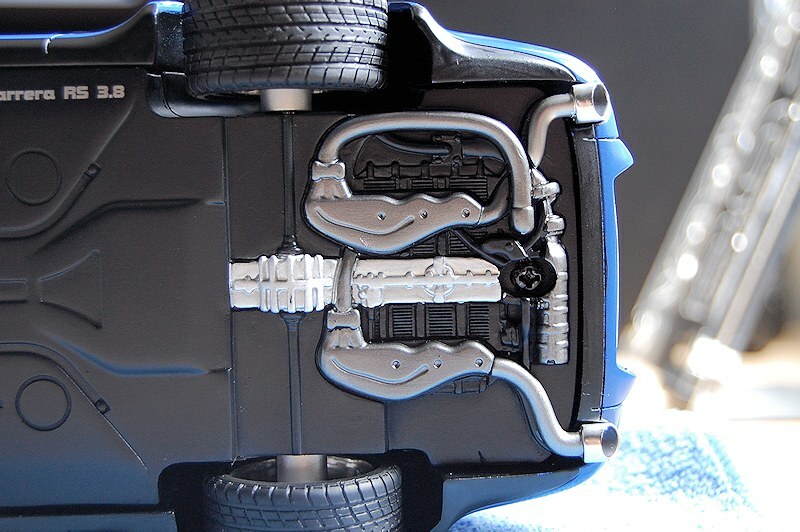 Flip the model over to the underbelly and there is remnants of a bottom end and exhaust, though a little crude in execution. 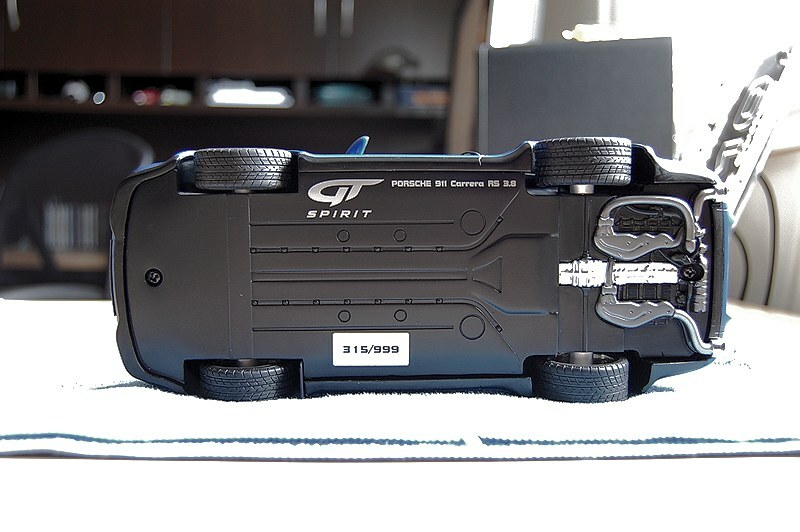 I’d like to highlight the plaque number plate as it does showcase GT Spirit’s commitment to defining their brand and added value. 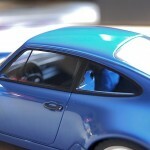 Porsche fans, we’ve waited way too long for a 911 964 RS 3.8 to be addressed in 1:18 scale. Get off your rear and buy one in either Club or Dealer version before it’s too late! The model is really that good! 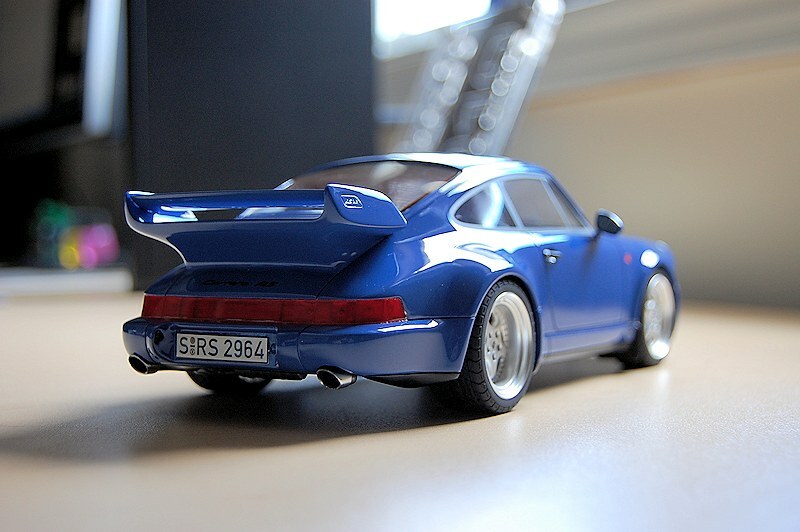 I would prefer a full scale diecast with opening bits, and maybe one day my wish may come true. Until then I will display this beauty proudly. GT Spirit, thank you, I’m looking forward to future releases. 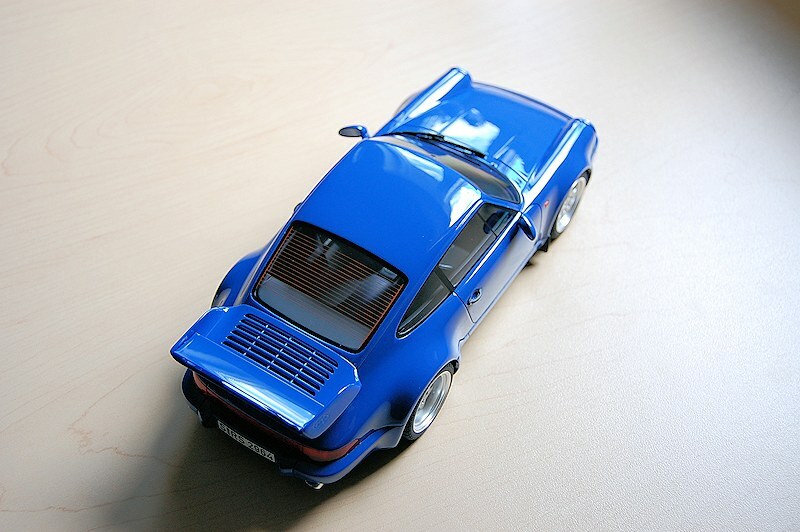 I’m off to order the GTS 911 Targa Top. Enjoy the pics! 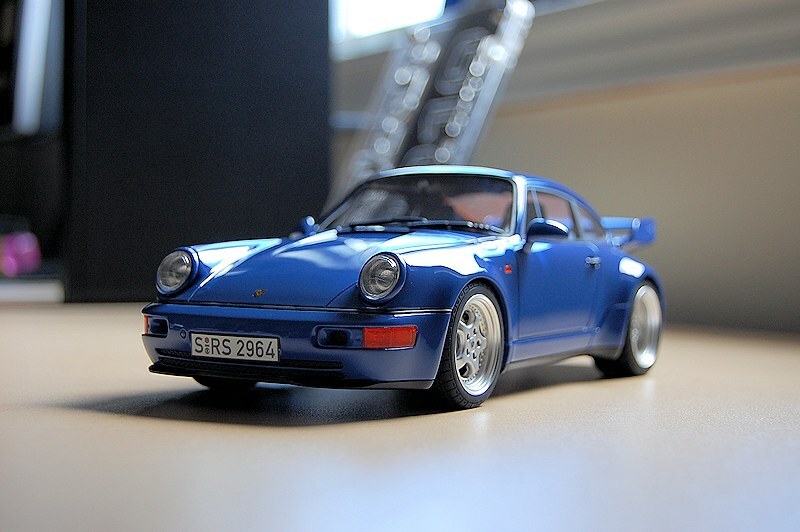 5 Responses to "REVIEW: GT Spirit Porsche 911 964 Carrera RS 3.8"
So I just received my VISA bill, the cost of the above model after currency exchange was $150.61. This is includes shipping and handling. 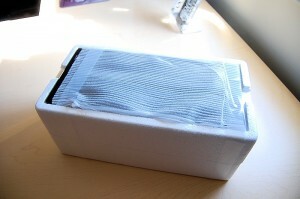 If you factor $30 for shipping $120 isn’t too bad. Beautiful pictures. 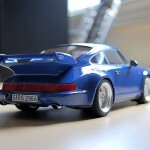 Well if you are Porsche mind, visit also my website. 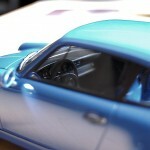 It’s only about Porsche models and of course you will find the GT Spirit models too. Hope tot see you there. Did you get this exact model from the exact site? 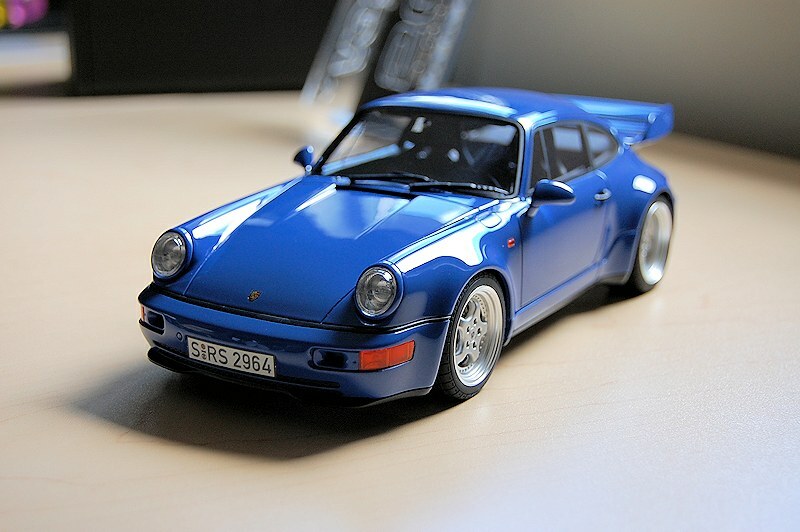 I want to add this color to my model collection but cant find it. I believe I pre-ordered the piece through their website. It is long sold out! A simple search on eBay found two, this is the cheaper of the two. Good luck!